I love when Swagbucks has Swag Code Extravaganzas, they are one of the easiest ways to earn SBs! What are SBs you ask? SBs are points you earn on Swagbucks, a website where you can get gift cards for the things you do online. I redeem around $100 in Paypal every month with Swagbucks! What are you waiting for? 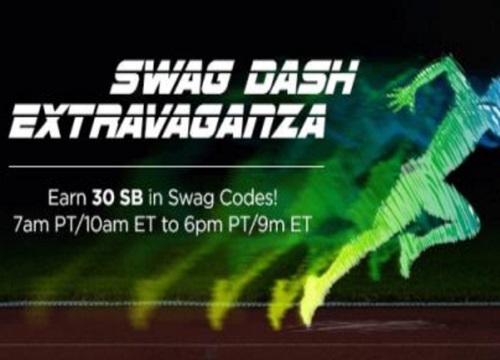 The Swag Dash Swag Code Extravaganza will be happening Wednesday, August 17 from 7am PDT/10am EDT to 6pm PDT/9pm EDT. All you have to do is look out for the Swag Code notifications, enter the code, and you earn SB (which can be redeemed for gift cards)! There will be 6 Swag Codes throughout the day worth a total of 30 SB. Look for Swag Codes on the following places: Facebook, Instagram, Swagbucks, Go For The Gold Team Challenge, Refer & Earn, Back To School Sale. As always I will be posting alerts for all the Swagcodes that I find throughout the day on our social media platforms, linking back to this post. Follow us on Twitter here to get notified when there is a code out, that's the fastest way to ensure that you see our posts.